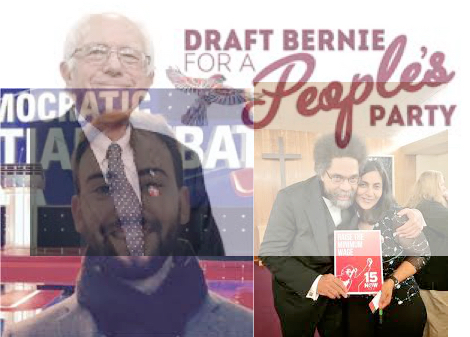 Seattle city council member Kshama Sawant, left academic Dr. Cornel West and Nick Brana, founder of “Draft Bernie” will be hosting a “town hall” meeting in Washington DC on Sept. 9 to inaugurate a new political party, the “People’s Party”. Their plans seem to be getting some press coverage. Nick Brana, Cornell West and Kshama Sawant. The shadow of Bernie Sanders hovers over their “People’s Party”. Key to understanding the US political situation is the necessity for clarifying the class question. It is the confusion around this issue that allowed millions of disgruntled US workers to vote for the reactionary racist bigot, Donald Trump. This situation within the working class is defined by the absence of a mass working class party. All parties are based on one class or another. The Democratic and Republican Parties are based on the class that lives off of its ownership of capital – the capitalist class – although they play somewhat different roles. The Republicans are used to more aggressively drive forward the attacks on the working class, people of color, etc. While the Democrats also carry out such attacks (to a lesser degree), their main role is to blunt any serious working class opposition to these attacks. They do that by enticing the opposition into their party, where it dies a slow death. In carrying out this role, the “progressive (liberal) wing” of the Democrats performs yeoman service. The party as a whole could not play that role without the “progressive” wing. The alternative to these two parties is a party of, by and for the working class. 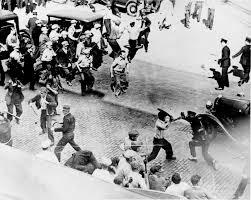 Minneapolis Teamsters Strike of 1934. 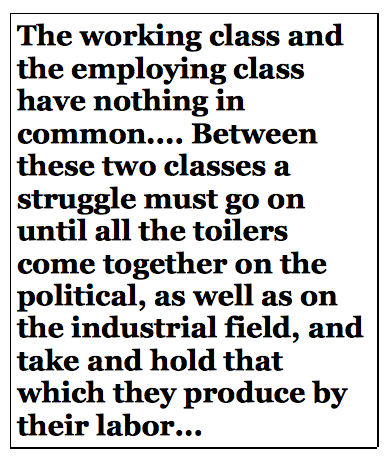 A mass working class party would link up the struggle of masses of workers with the electoral struggle. fight around all the issues that confront us. It would organize the fight in the streets, the communities and schools, the work places and, yes, in the unions also. It would pose all issues as issues to be resolved by and in the interests of the working class. It would help workers and young people draw lessons from the struggles. By its mere existence, it would enormously raise the class awareness, the class consciousness of tens of millions of workers and youth. While it would serve as an organizing center for the struggles of millions of workers and their allies, in the end, it would not be able to avoid the issue of elections. Either it would put its own candidates up for office, or it would end up supporting the “progressive” Democrats. In doing so, it would be dragged ever deeper into Democratic Party internal politics, seeking to strengthen the “progressive” wing of the Democrats. It would then have to drop its open class appeal, and it certainly would not be able to have an explicitly socialist program or policy. And this People’s Party to be? The very fact of its name does not bode well. Nor does some of the history of Kshama Sawant. She has repeatedly supported liberal Democrats, most famously but not only Bernie Sanders. In several local city council races she implicitly supported local liberal Democrats. Nor does she and her group, Socialist Alternative, show no willingness to oppose the union leadership. She repeatedly attacks “the Democratic Party establishment” but not the Democratic Party as a whole. And how could she? How could she explain the class nature of this party, when she supports representatives of its “progressive” wing? As for Dr. Cornel West, while he makes some good speeches and thoughtful comments, he seems pretty much cut off from the working class, so how would he be able to provide a clear class perspective? Finally, there is Nick Brana of “Draft Bernie”. Before being the National Political Outreach Coordinator for the 2016 Sanders Democratic presidential campaign, Brana was a high official in the gubernatorial campaign of Terry McAuliffe when McAuliffe ran for governor of Virginia. After Clinton won the nomination, Brana supported Jill Stein, based on the assumption that Clinton was assured a victory. He argued that if Stein won 5% of the vote, it would put “progressive” pressure on a President Clinton. Recently, Brana seems to have given up on reforming the Democrats, but from his Draft Bernie for a People’s Party, he seems to be trying to build a progressive Democratic Party, Mark 2. It’s clear that the call for a “People’s Party” is seen purely as an electoral plan. Just as a true working class alternative to the Democratic Party cannot be independent of that party without running its own candidates, so likewise running candidates cannot really build working class consciousness and power if it is not linked with the struggle of workers of, by and for themselves. It is hard to see how this “People’s Party” would be very different from the Green Party, in fact. 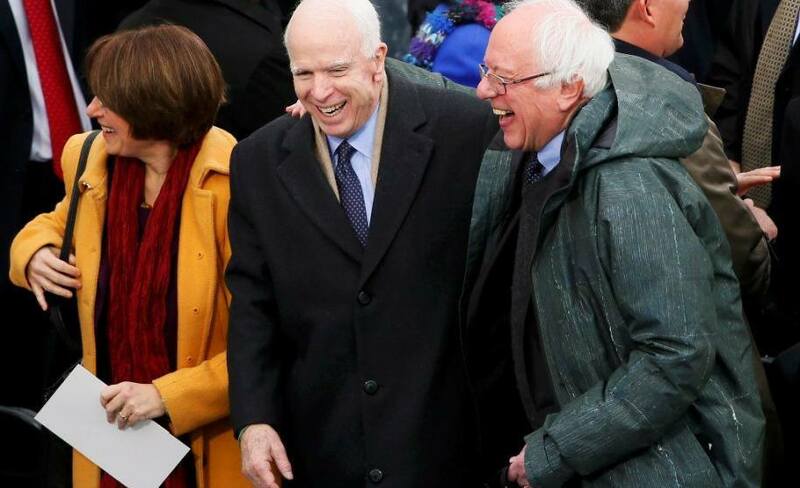 Bernie Sanders and Nancy Pelosi happily attending Trump’s inauguration with right wing Republican war hawk, US Senator John McCain. anything but trying to strengthen the progressive/liberal wing of the Democratic Party. More importantly, socialists should be calling on the working class to look to its own strength and its own organizations for a way forward, not count on liberal capitalist politicians like Sanders. By continuing to call on him to lead a new party, they are continuing to draw people’s attention in his direction, meaning in actuality continuing to strengthen him (to the extent that this call has any influence). It’s easy to see why Brana and West would have a political position that doesn’t stress the class nature of politics. Preamble to the constitution of the Industrial Workers of the World. They were later confused about the role of a political party but at least the understood the class nature of society. the Democrats and the union bureaucrats. Then she made a decisive step in directly supporting Sanders. Doing so made her incapable of explaining the class nature of political parties, and that has driven her and her group even further into the classless “progressive/liberal” swamp. The alternative to this confusion is to openly explain that the Republicans and Democrats are irreversibly parties of the capitalist class and that the working class needs a party of its own, as described above. A serious start in that direction could be made by different forces such as DSA running local candidates for offices like city council or board of education. These would campaign by explaining the link between the local issues and the necessity of building a mass working class party as a step towards resolving those issues. They would run as representatives of the working class, not “the people”, and as open socialists. They would also explain that if elected, they cannot resolve the issues for workers; what they can do is use their office to help workers organize to fight to solve their common problems together. That is the way forward as opposed to these confused appeals for a “People’s Party” which claims it will solve problems for workers by simply participating in elections around progressive/liberal causes. Update: We received the following comments from Mark Lause. We think they are a useful addition, although we wouldn’t see the “People’s Party” written above as a bourgeois nor as a workers’ party, but most likely as a petit bourgeois party (if it ever even achieves the status of a real party). But his main points are well taken. I agree with much of this article . . . with a few caveats/additions. Yes, all parties have a class nature, but we shouldn’t embrace the implication that this can be equated with their self-labeling. American civilization is such a pervasively advertising and public relations culture that we really need to give some thought to this. The class nature of ‎Lyndon LaRouche’s organization had nothing to do with its decision to call itself the “U.S. Labor Party” and–conversely–a “People’s Party” isn’t necessarily a bourgeois formation because it doesn’t have “worker” or “labor’ in the name. In the case of this new formation, I think there are more serious problems. No mass independent party movement large enough to have a serious impact comes about just because a handful of radicals decide to start a new party. They have to be rooted in genuinely mass movements or associations or networks with an importance that goes beyond a specific locality or the sectarian concerns of any particular component(s). Small efforts can be used to encourage such movements. In this case, I am concerned that the predominant founding concerns may be far too narrow to serve a wider interest. Most importantly, nothing like this can accomplish much without clear institutional commitment to a broad democratic inclusiveness–in decision-making as well as participation. It should be capable of subsuming all those vast numbers that have often gone to the polls to vote Green, for example, and then left voiceless by the Greens in the fuiture shaping of their insurgency. Simply, put, I don’t think that this thing can actually be done top-down by having a few recognizable names on a call. Or, insofar as it could be, it wouldn’t take us anywhere farther than the Greens has gotten . . . which would amount to nothing more than reinventing the wheel . . . .and a square Green wheel at that. And finally, my impression of the commitment of Socialist Alternative–the most obvious organizational participant in this–to independent political action is that it can be very inclined to opportunism . . . especially after taking both sides of the vital question as to how to deal with the Sanders campaign.